Sam Gagner is back with the Edmonton Oilers, the team with which he spent the first seven seasons of his NHL career. 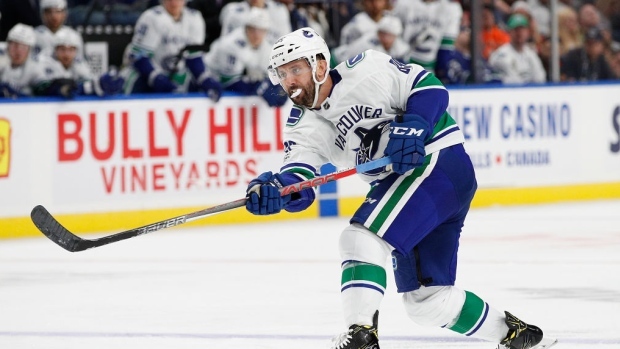 The Oilers acquired Gagner in a deal Saturday with Vancouver that sent centre Ryan Spooner to the Canucks. The Oilers expected to have the 29-year-old Gagner for their road game against the New York Islanders on Saturday night. "We've liked Sam to be a part of our club," Oilers assistant GM Keith Gretzky said on the team's website. "He can add experience in the locker-room and we think he can help us on our power play." The Oilers selected Gagner sixth overall in the 2007 draft, and the 29-year-old posted five consecutive seasons with 41 or more points to start his NHL career. He's spent most of this roller-coaster season however on loan to the Toronto Marlies, scoring 12 goals and picking up 37 points in 43 AHL games. "It's a great situation for us and for himself," Gretzky said. "He wants to play in the NHL and he's going to get an opportunity. I feel that he's going to help our hockey club." The deal comes less than a day after the Oilers sent Cam Talbot to Philadelphia for fellow goalie Anthony Stolarz. Meanwhile, Vancouver is the third NHL stop this season for Spooner, who has split his 2018-19 campaign between the New York Rangers, Oilers and Bakersfield Condors. The 27-year-old from Ottawa had two points (1-1-2) in 16 games with the Rangers, three points (2-1-3) in 25 games with the Oilers and six points (2-4-6) in seven games with the Condors. Originally drafted by the Boston Bruins in the second round, 45th overall in the 2010 NHL draft, Spooner has collected 163 NHL points (48-115-163) in 314 career games.